AGS is committed to furthering geographic learning and providing materials based on teachers’ needs. As part of the Geography Teacher Fellow Initiative, AGS composed targeted activities throughout the year to help teachers incorporate geographic and geospatial tools that complement the AP Human Geography curriculum into their classes that are otherwise not readily available to them. 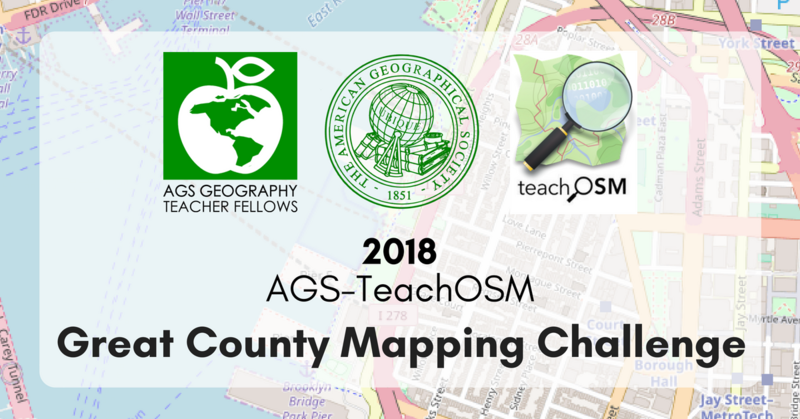 Introducing the 2018 AGS-TeachOSM Great County Mapping Challenge! Basic Geographic Information Systems/Science (GIS) application skills have increasingly become essential in many fields related to geography. AGS, partnered with TeachOSM (OpenStreetMap), provides Teacher Fellows with the opportunity to take part in a series of fun and informative web-mapping webinars aimed at offering teachers a foundation in map building skills they can incorporate in the classroom. TeachOSM takes what can be an intimidating application to approach, and creates fun and accessible lessons so that teachers walk away excited about the knowledge they can pass on to their students. The American Geographical Society’s Fall Symposium brings together recognized leaders in business, government, science, and education that might not otherwise have the opportunity to interact, and provides opportunities for discussion, debate, and collaboration to further the understanding of how geography is going to shape the future. Through the generous sponsorship of the program by Boundless, the selected Geography Teacher Fellows receive a unique opportunity to interact with, and become one of, the nation’s thought-leaders participating in a dialog about the future of geography. Learn more about this year's Symposium. Following these webinars, Teacher Fellows get to put their web-mapping skills to the test at the Mapathon the morning of the Fall Symposium. Thursday morning, Novermber 15th, before Geography 2050 commences, Teacher Fellows participate in mapathon sessions that allow them to implement their techniques and creativity in the geography field which they gained through the teachOSM web-mapping webinars. The AGS Geography Teacher Fellows Initiative is made possible through the generous contributions and volunteer efforts of our sponsors and contributors. Click on their logos to go directly to their sites.